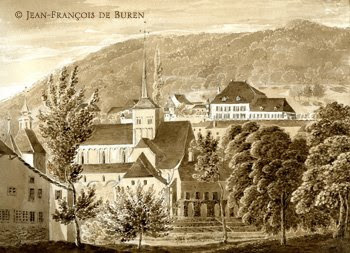 Albert was the only son of Charles Philippe de Büren (1759-1795) and Charlotte Elisabeth de Büren (1765-1837). 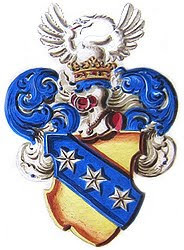 Member of the Grand Council of Bern, Governor of Moutier, Lord of Valangin and the last Baron of Vaumarcus. 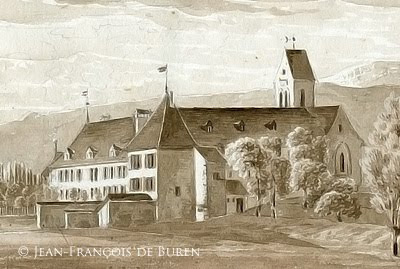 In 1831 the sovereign of Neuchâtel, the Emperor of Prussia, ordered all of his patrician land owners in Neuchâtel to exchange their feudal rights for an indemnity. Albert could not refuse the Imperial edict. 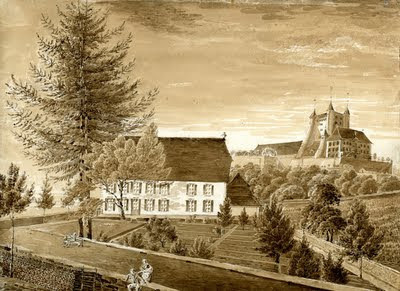 As a young man he studied botany and Thaer's agricultural school in Berlin and became a great botanist in his own right. 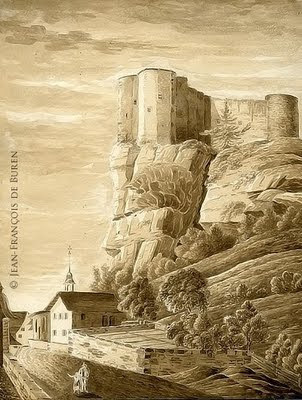 He was also instrumental in the founding of the Neuchâtel Natural History Museum with his friend Louis Coulon. 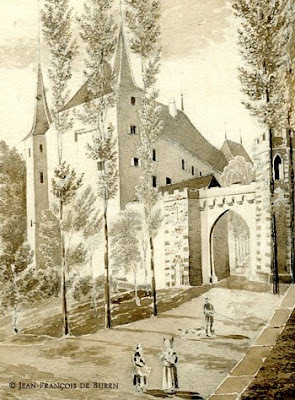 He was a great amateur painter like his father and was beloved by all those who knew him. 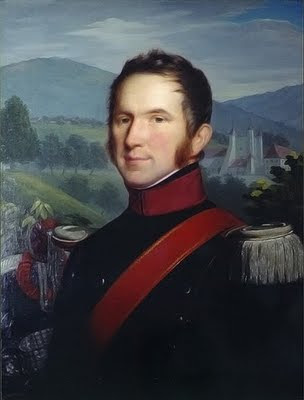 Albert de Büren (1791-1873), painted in 1820 by David Sulzer. 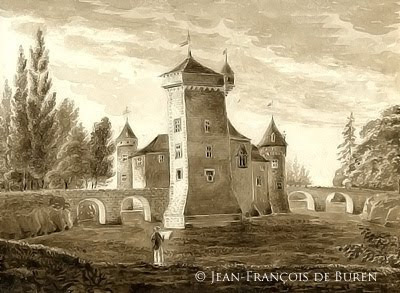 The Château de Vaumarcus is visible in the upper right hand corner. 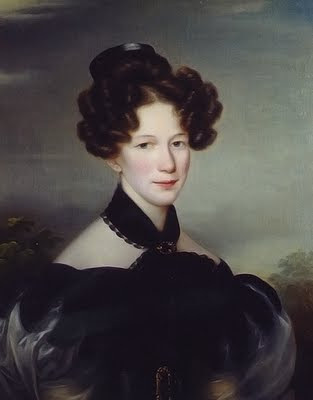 In 1820 Albert married Catherine de Senarclens (1796-1857) daughter of César Auguste de Senarclens, Lieutenant Colonel in the Swiss Guards in the service of the King of France and Marie de Loriol. 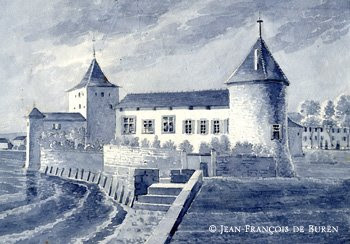 I somehow don't think the picture is that of the chateau de Loriol - more like Chillon! 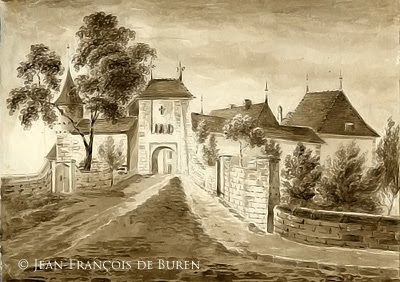 A blog that highlights the 800 year history of the Swiss-American-Argentine de Büren family.